LOWW3 Semi-Finals finished! Finals finalized!! The semi-finals are wrapped up and we have our four finalists for the LOWW-Cup! Congratulations ÐиΛ ηєאאσŗ ะ, αcore| Wattman, MaLaQueSh Marius89 and ¬ผผѕ.sτяıκєя! The semi-finals were both exciting to watch and closely contested. Not so much for the first place since both Nexxor and Marius went through quite easily, but Minimeier in Semi-Final 1 and Aclyptix in Semi-Final 2 were oh-so-close to getting the ticket for the final. Well done to both of them as well as Jux and Balyk. Just for fun and giggles we made a little graphical representation of each final, starting of with SF1. As we see, Nexxor seperates himself from the pack quite early while Minimeier and Wattman are caught in a fancy dance the whole time. Jux was always in the mix and wasn't far of, but just missed the big points. While Minimeier seemed to get seperation on "dive in" the track selected by Wattman and even later on Walla Walla (selected by Jux), Wattman managed to bounce back with strong results on "Ice Cubes" (selected by Minimeier) and "dive in". His late spurt on "dive in" stopped Minimeier from winning his last race and he used the momentum to close the duel between them on "Ice Cubes" to seal the ticket for the final. Semi-Final2 was a rollercoaster mostly thanks to Striker who couldn't decide if he wanted to dominate or just relax a bit. Marius consistency and overall great times earned him the win by quite some margin. Similar to Jux in the first final, Balyk was always around the others, but he won too few rounds with the others winning at least twice as much. While Striker looked to run away with the victory on the first three tracks, he imploded on Spektros (a track selected by himself) and even fell back to 3rd position on Argh-Final (selected by Balyk). Aclyptix jumped at the opportunity to grab the last ticket to the finals, but failed to win twice against Striker who bounced back in time to snag the ticket out of Aclyptix grasp. A huge thanks to everyone for participating and making this event possible! Phase 2 of our event will start soon! Participants of the 2nd Phase can select their prefered tracks from the 20 tracks of our map pack. You can now download the complete Mappack for our 3rd LOWW. 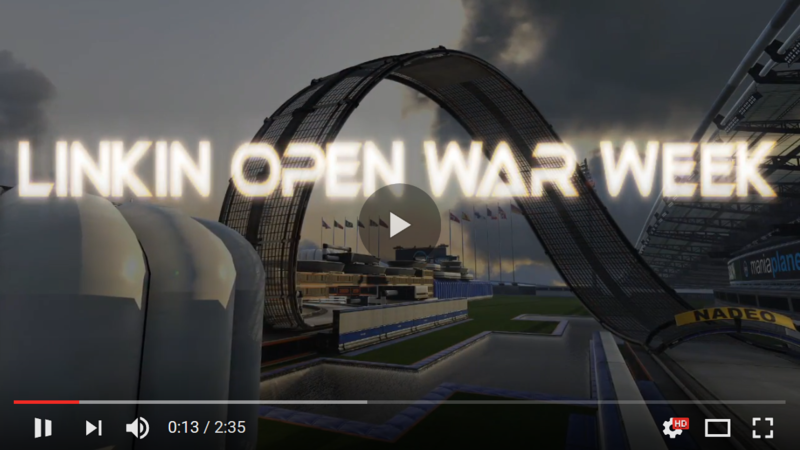 We'll be hosting the 3rd Linkin Open War Week starting 18th Sept. 2016. More Infos will follow soon, but to get you hyped up we're proud to show you our Trailer Video for the LOWW3!